A bumble on the buds! The horns are incredible. or of warm sunny days and autumn asters? They are Sleeping Beauties in my garden. On warm days they are up before I am out in the gardens. The cooler autumn mornings finds them sleeping in; wrapped securely on a flower. You can wake them up with a kiss~~~ if you're brave! But, a gentle pat or stroke on their fuzzy backs might be easier. Be very gentle. They are more fragile then we think....They fool us with their noisy bluster and buzzing to frighten us away. Rarely do they sting. They are too busy to bother. A honeybee very much awake! But, watch out for those honeybees~~They have tempers! Don't worry. They can take the gentle and loving touch of the gardener's hand. So pet them. Appreciate them. Delight in them. It bears repeating~~provide for them. * ~~and they'll continue to provide for us. If you want to learn more about Bumbles..I've written a post about what we gardeners can do to help them...Go here to read Taking Care of Bzzzness. Gail, I love finding bumblebees sleeping under the flowers. It seems to make the early morning garden a bit more magical. I was just marveling in sleeping bees yesterday. They are amazing to find. H.
Gail girl I love this post ! I have never seen so many sleepy Bumbles as I have this year .. they have been amazing .. and in multitudes, so that, is a wonderful positive event here ! Great post, Gail! We do love our bees (but not our yellowjackets!). But, er, do you really touch them? Wow. They look so cuddly in your shots! The bumbles rarely bother me and they are everywhere here. It does seem though that the bees are getting agitated more easily of late. Perhaps they can feel the change in the weather and are anticipating the coming winter! I haven't seen any bumbles around here for a few days. It has been too cold and wet. They are such sweet little fellows. Your photos are good Gail. How fun to find the sleeping bees. We have so many carpenter bees that to see a bumble bee is a treat. They are so much smaller than the carpenter bee. Wonderful bee post, Gail! We had lots of bumblebees here this year, just very few butterflies. They are more than welcome in our gardens...intoxicating drink from the flowers makes for a good nights rest.. I am not brave enough to wake them, but I love finding the bees crashed out on the flowers in the morning. 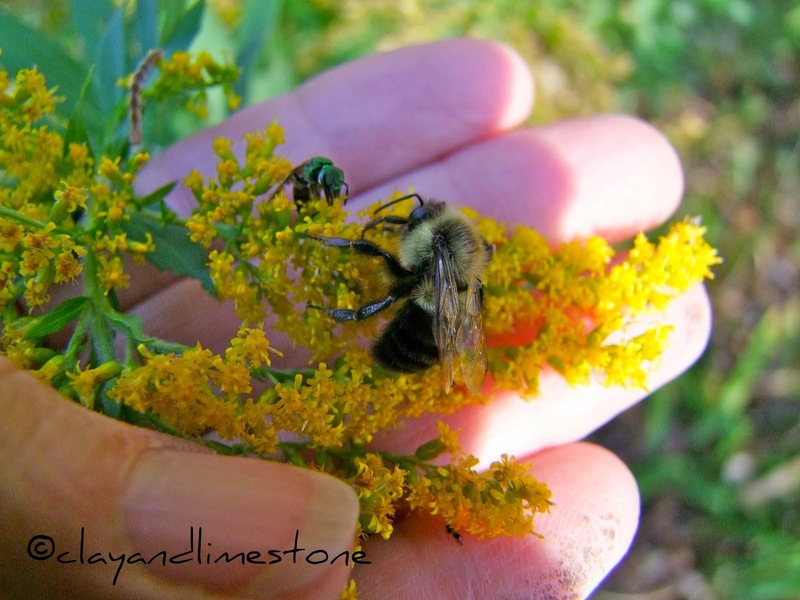 Unfortunately all the goldenrod and Joe Pye flowers are gone now, so no more sleeping bees until next year! I guess I don't get out early enough to find sleeping bumbles, although I don't often see any awake ones either, so maybe my garden hasn't attracted them. I do see a lot of honeybees though. Gail, I'll hope you'll join in this week with a post about a National Park you've visited. I'd love to hear your story! How beautiful. I especially like that close up of their horns. I've thought of petting them before but wasn't sure it was possible. Maybe I'll give it a try now, if it ever stops raining (where do they go in the rain??). I sometimes find them when I am watering. Then I carefully move them to a sunny spot on the potting bench so they don't wake up to a morning shower. Thanks folks for stopping by and leaving a comment...I've been out in the garden with fellow blogger Prairie Rose. Rose and her husband stopped by and I have had a great time visiting with them! Not one photo though! We had a "pet" bumble bee that was on one of our coneflowers for a couple of days. Wasn't acting dead or alive, really -- so yes, I guess he was sleeping! Bees are dying worldwide. Colony colapse syndrome seems to be the main culprit in UK. We have lost 20 per cent of our honey bees. I still have bees on my obedient plant, too, though it's getting cold here. And, personally, I toss and turn and move a LOT in my sleep! Let sleeping bees lie. Even the 'impatiens' need rest. I have never thought of bees sleeping and dreaming, Gail ... shame on me! But I certainly enjoyed a bumper crop of bees this year (after over 30 years of gardening, have never been stung by a bee). Lucky for you to meet Rose ... now that is a dream of mine! It is lovely to see them in the garden.I can't help but picture the bee falling asleep face down in a plate of food! They can be very slow to wake - no wonder we often think they are dead. Great post Gail. I haven't petted a bumble, don't know if I want to. They are pretty. We have the carpenter bees here. Actually I haven't seen any Bumbles. I've got a wasp nest on my bench so must do something about that or not sit there. Same bench that my GGS moved & spent better part of night in hospital. The wasp got him in the eye. Poor little fellow's eye was swollen shut. When he learned I was there he wanted me. Wonderful post Gail. The bees work so hard, they need a good night's rest! I haven't petted any bees, but we work in very close proximity. :) They do look appealingly soft and fuzzy. Gail, lovely post! I especially like the 2nd photo, he really looks so comfortable and is using the petal as a pillow. Thanks also for the info. We had so many bumbles in the garden this summer, but fee honey bees. I only saw them on the sunflowers. I hope Rose took some photos! I am glad she and hubby made it to your garden. She had been hoping to make time for a visit. Have a great week! So cute! The bumbles were dozing on the blooms in my garden today. The temps are starting to fall. beckie, I loved seeing Rose and missed you being with her. Next time...both of you come to stay! She took some photos...but there isn't all that much going on in the garden! Tales of a Bee Tickler, that was an article in a garden magazine some years back. Have you read the novel, The Secret Life of Bees? I luv the idea of bumble bee dreams! Both our warm weather and the bees are gone and I miss them. Nice to come here and see your photos. I am bountifully blessed by bumblebees here on my corner of Katy. I don't think I've ever caught them sleeping, though. I'll have to pay closer attention! The bumblebees have become a favorite of mine, and I agree they won't sting; I think of them as my companions in the garden. Such delightful photos, but it was even more of a delight to see all the bees so busy in your garden yesterday! I can see why they enjoy it so--you have created a beautiful haven for them. We left early Friday morning so I missed your last post--what a thrill to see the Monarchs, not to mention actually being able to photograph them! I'm afraid all the butterflies have left us for good, and probably the bees as well--it's darned cold up here! As for the stock tank, I think you made an excellent choice with the oval one; can't wait to see where you decide to put it and what to plant in it. Thank you so much for allowing Hubby and me to tour your garden; I'm hoping it warms up here next week so I can plant all the gifts you so generously shared with me. Your post is so fascinating! As always, your photos are beautiful, but I had no idea that bumblebees slept on flowers. I have sleeping red wasps crawling out of the knooks and crannys of the house now! Guess these was a nest in the attic this year and they are seeking the warmth in the house, boy what i would give to turn them into cute little bees asleep on flowers! Our evening walks in the garden are oftentimes amusing: we laugh at the huge bumble bees straddling a blossom, motionless, and remark "they are drunk with nectar". What a totally lovely post. Sweet babies. Of course they are night night in your gardens cause they feel secure and comfy. Sweet, sweet bumbles! I'm so sad that we don't have bumblebees in this part of Australia, but I totally fell in love with the ones I saw in Europe, the UK and New Zealand. Please pass on my loving thoughts to your bumble visitors! who make our souls blossom. Plant smarter~plant more flowers and don't use pesticides. Imperfection is the new perfect! Embrace pests and give up using pesticides! Please join in a Celebration of ALL Wildflowers on the Fourth Wednesday of Each Month: 3/28; 4/25; 5/22; 6/27; 7/25; 8/22; 9/26; 10/24; 11/28; 12/26. WELCOME TO MY Zone 7-ish Mostly Native Garden, I'm Glad You Stopped By! I've been gardening here for more than 30 years. Plants have to be rugged to survive our wet winters and dry summers~that's why I plant Middle Tennessee and Cedar Glade natives that will grow and thrive in clay and limestone. 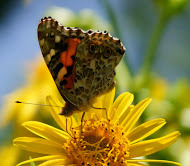 You can email me at gailtiles@gmail.com with your wildflower gardening questions. Congrats on getting your doctorate. Way to go Dr. H! We are so proud and love you infinity. Quite Possibly The Worlds Most Wonderful Cat. Your Visits and Comments Are the Delicious Icing.